Estate planning is a topic that most of us would like to completely avoid addressing. Less than half of Americans have a will or other basic estate planning documents in place. It’s no secret that most of us don’t enjoy the estate planning topic. Some assume there isn’t an estate to plan for in the first place while others procrastinate and assume this is something that can be taken care of after retirement. 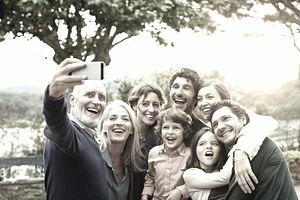 Everyone needs a basic estate plan and it’s also important to recognize that an effective estate plan is about more than just leaving behind a legacy to others. Step 1: Establish meaningful goals that matter to you and your loved ones. Think about what you want your estate plan to accomplish. One way to help give your estate plan more purpose and meaning is to address the following questions and writing down a list of the things that are most important to you. Are you concerned about choosing an executor or a guardian for your children? Do you have any charitable giving plans? Are you concerned about finding ways to avoid the time and expense of probate? Do you have important family values or stories that you want to pass along through an ethical will or legacy letter. After identifying what matters the most to you, schedule a time to take action and make sure you have a basic estate plan in place. If you need some help getting organized, you can use this Personal Estate Planning Worksheet to begin putting your goals in writing. Step 2: Get your financial documents organized. Reviewing whether or not your retirement plan is on the right track requires a little organization. First, try to locate important retirement account information for 401(k) plans, IRAs, brokerage accounts, etc. Then, make sure you have account information for bank accounts. But don’t stop there. Take time to consolidate life insurance policy information and any old estate planning documents such as wills, trusts, powers of attorney, or living wills that you haven’t reviewed recently. It’s also important to keep a list of online account passwords and digital assets in a convenient location for loved ones to access just in case something happens to you. For more information on organizing your documents check out this resource at Nolo.com. Step 3: Evaluate your overall financial wellness. Start by completing a net worth statement that includes a list of your assets and liabilities. Once you’ve compiled a list of your financial resources, you are in a better position to determine who should receive your assets after you pass away. You’ve also taken an important step in tracking your overall financial wellness. This step also involves reviewing your life insurance to cover your family’s potential needs for income, future education expenses and the costs of settling an estate. Reviewing disability insurance is just as important because it provides income protection for you and your family during your lifetime. For more information on life and disability insurance coverage, including needs calculators, visit www.lifehappens.org. These essential documents give you an opportunity to officially state your wishes for how to distribute assets when you die. You also can use wills to name guardians for your children. Other documents may be necessary depending on the complexity of your financial situation or the amount of additional control you desire. Trusts are legal arrangements that allow you to determine how and when the property is distributed to your heirs. In certain situations, a trust may be necessary to maintain even more control over the distribution of your estate. If funded properly, many trusts can also help you avoid probate (wills are subject to probate). If you aren’t sure where to turn for help in creating your important documents you may refer to this guide on How to Choose an Estate Planning Attorney. You may also check with your employer to see if they provide a prepaid legal service or free online document preparation. If not, sites like LegalZoom and Nolo provide online tools to help get these documents created, which is important if you are concerned about the costs of hiring an attorney or have a fairly straightforward plan. Just remember that if you don’t have these important documents in place you still have an estate plan—it just happens to be a plan based on the intestacy laws of your state. Step 5: Update your beneficiary designations and title assets appropriately. A common misconception is that once a will has been established the estate planning work has been completed. Nothing could be further from the truth. The last will and testament only controls the distribution of assets that are subject to probate, which is the formal process of paying off debts and distributing property. Depending on which state you live in now or during your retirement years, the formal probate process can potentially be expensive and time-consuming. To make matters more complicated, not all assets transfer through probate. Therefore, it’s important to identify assets that do not pass to others through a list will and testament. These are often called will substitutes and include any accounts with beneficiary designations such as insurance policies, retirement plans, IRAs, and annuities. Any jointly owned property or accounts bypass probate as well as accounts designated as payable on death (POD) or transfer on death (TOD). Step 6: Share your plans with everyone who is involved in them. Communicating your intentions in advance can help avoid family conflicts and also minimize the potential for any confusion or questions regarding your true plans. If you have a plan in place but nobody has a clue it exists then your wishes may be completely ignored or there may be significant delays in figuring out your desires. While estate planning may not seem as urgent as other financial goals such as eliminating debt, saving for retirement in a 401(k) plan and/or IRA, or creating a retirement income plan, they can be the most important part of your financial plan when you need them. The problem is that if you don’t have these essential plans in place well before you reach your retirement years, it may be too late. Is Your IRA Protected in a Bankruptcy?